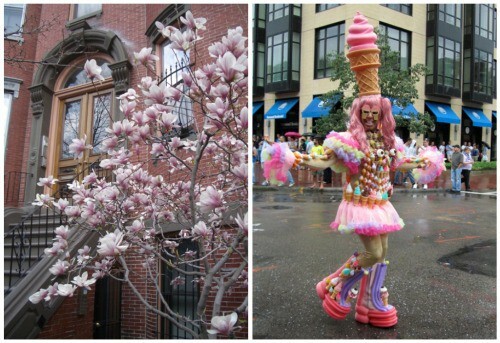 Boston’s seedy South End was surely a place to avoid in the 1980s. It was mostly rooming houses and cracked pavement. Then the gays rushed in with their textured paint, pleather and fabulous faux everything and rents went wheeeeee!! Someone hung a disco ball in a local hairdresser shop and Boston’s gayborhood was born. Though some will tell you its gay heyday has come and gone and that you’re more likely to see a straight couple pushing a $1,000 stroller these days than two guys holding hands, the neighborhood is still home to the starting line for the city’s Gay Pride Parade and probably the greatest concentration of GLBTers in the city. Luckily for you traveling foodies, both yuppies and hipsters (gay or straight) tend to love good food just the same and the South End has sprouted quite the crop of eateries. We pay (and pay and pay) homage to those who came before us to beautify the neighborhood and gussy up its shops and restaurants because they are precisely the reason why we moved here a few years ago. From our first date in Delux—where the decorations are Graceland meets Macy’s Santaland on the day after Christmas and the kitchen is smaller than our walk-in closet—to the South End Buttery, where our families toasted to our life together the night before our wedding, we’ve played out our relationship in many of the South End’s great restaurants. We’ve recently left the city for a house with a yard, but our tastebuds long for the South End, so we visit often. Perhaps this Sunday, we will roll out of bed and into the car for a trip to Tremont647‘s pajama brunch and nosh on sticky, sweet and nostalgic pop tarts! Oh, they’ll be well worth it. We hope to see you at the table next to us soon. 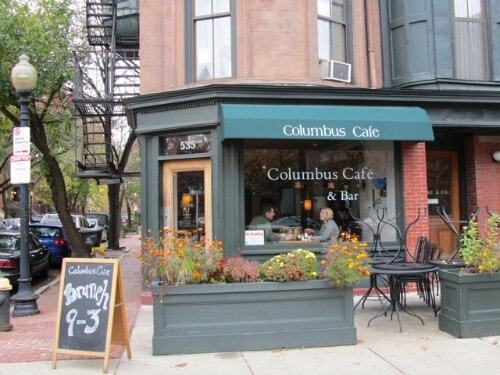 Just steps from our old front door sits Columbus Café (535 Columbus Ave., 617-247-9001), our favorite standby and neighborhood gem. The service is slow, but so incredibly friendly and inviting you won’t know as long as you’re not in a hurry. Start with a basket of warm bread and an order of the dreamy, creamy artichoke dip before digging into the chicken enchiladas, vegetable primavera or chopped salmon burger with sweet potato fries. You’ll want to come back when the menu features their wonderful Southern BBQ ribs with cornbread and watermelon. We’ve also never gone wrong with their nightly specials. But whatever you choose, don’t leave without trying Kevin’s homemade white chocolate bread pudding. 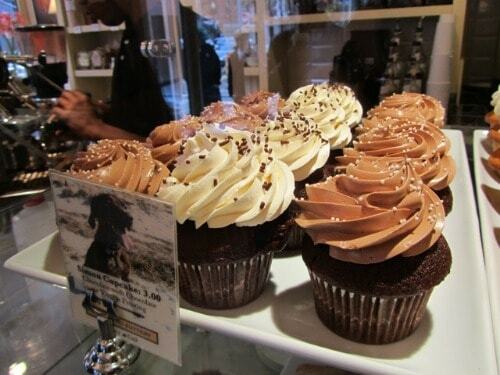 Flour (1595 Washington Street, 617-267-4300) is a bakery and so much more. Super pastry chef turned sandwich scientist Joanne Chang serves up a sugar brioche and just-made raspberry seltzer that will make your morning, but everything in here gets an A+ for presentation and taste. That includes the chipper blackboard menus scrolled with upbeat quotes and a weather forecast that always sounds good no matter the precipitation. Our fanatically finicky real estate agent will tell you it’s worth a trip from the ‘burbs just get her lips on Flour’s homemade Oreos (and that may be true), but we return again and again for the sandwiches. Try the roasted lamb with tomato chutney and goat cheese or the grilled roast chicken with brie, arugula, roasted red peppers, and caramelized onions. 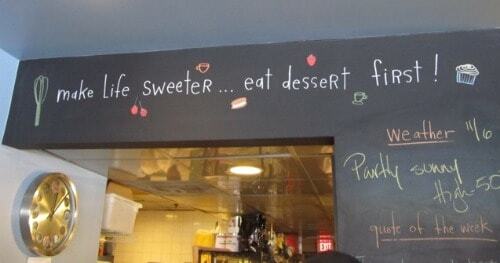 And grab a dessert to go; they’re all wonderful. Eat at Jae’s (520 Columbus Ave., 617-421-9405), live forever! At least according to the sign over their door…. Sometimes you just want to sit on your couch and eat something out of a to-go container with a pair of chopsticks. Enter Jae’s, home of the best chicken Pad Thai we’ve ever had, and we’ve had a lot! There seems to be a Thai restaurant on every block in the South End, but like Goldilocks out on the town, we tend to find the Pad Thai either too crispy, too sweet, or too spaghetti-like, but Jae’s is just right every time. If you’re in the mood to go out, we still recommend it. The sushi bar is one of the best in all of Boston and home to the perfectly priced and generous sushi lunch box, which comes with soup, salad and noodles. Explore all of Boston’s neighborhood haunts under one roof at Parish Café (493 Massachusetts Ave., 617-391-0501), a mini EPCOT Center in the South End! Kinda. 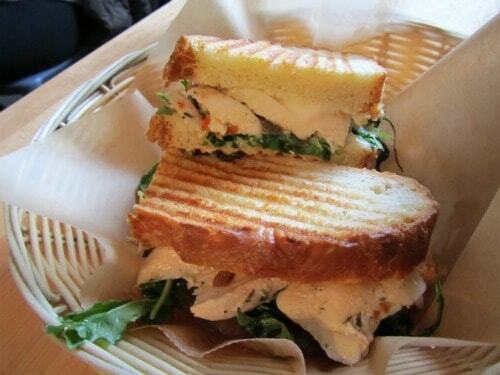 Parish serves up homage sandwiches borrowed from the best menus in the city, and (unlike so many other establishments in our fair city) this place is open past midnight, an important safety tip when dining among the Boston’s still-lingering Puritanical Blue Laws. The Black and Blue (rare steak and blue cheese) goes great with one of their cordial martinis (which are creatively crafted to fill the gaps in their beer and wine-only liquor license—damn you Puritans!). Boston’s best french fries (parmesan-garlic or regular) are served up at the South End Buttery (314 Shawmut Ave., 617-482-1015), a coffee shop turned lunch counter turned elegant eatery. Its evolution from coffee and donuts to martinis and braised veal is a bit of metaphorical mirror for our relationship—LeeMichael’s bachelor pad still sits high above the Buttery over the neighborhood laundromat. There, he dined on mac & (powdered) cheese and Chinese delivery. We’ve all come a long way! When you visit, choose a seat in the bustling bar upstairs or the more intimate lower dining room (where we had our rehearsal dinner). Start with the mussels in a delectable Sambuca-spiked broth, which come with a hefty serving of the aforementioned french fries, have whatever fresh fish they’ve selected for the night (the appropriately buttery hake and halibut are personal favorites), and finish up with a dollop of their heavenly hazelnut semifreddo. Grab a carrot cupcake to go on your way out…they put so much icing on them, they will have to squish the lid down!